Researchers at the University of Illinois at Urbana-Champain are developing a portable graphene-based sensor that can rapidly and inexpensively determine whether an eye injury is mild or severe. The device is named OcuCheck and could aid in determining the extent of eye injuries at accident sites, in rural areas lacking ophthalmology specialists or on the battlefield. The sensor is designed to measure levels of ascorbic acid (vitamin C) in the fluids that coat or leak from the eye, which are found in low levels in the ocular tear film and in higher levels in the interior of the eye. The concept is that if severe damage occurs, the vitamin C leaks out in higher concentrations and can be detected. 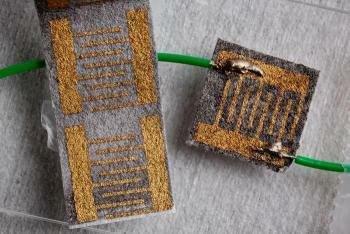 The new sensor uses graphene platelets that are layered 1 nm thick on filter paper. Upper layers include a unique polymer that interacts with the grapheneת gold electrodes and ascorbate oxidase, an enzyme that binds to ascorbic acid. When the ascorbic acid appears and binds to the ascorbate oxidase, it will pull the polymer out of its interaction with the graphene, changing the sensor's electrical properties. The researchers performed clinical testing with samples from 16 patients undergoing eye surgery and found that the sensor could detect a range of ascorbic acid concentrations with high sensitivity and accuracy. The OcuCheck has not yet been tested on samples from trauma patients. A new company called InnSight Technology was founded in irder to help bring the device to market and the company has obtained a phase I Small Business Innovation Research grant from the National Science Foundation.